I have seen multiple lists of iconic fantasy novels to read. The Chronicles of Thomas Covenant have almost always made an appearance. Because of that I finally managed to find the time to read the first entry. I will be upfront, I did not really enjoy Lord Foul’s Bane. I knew little about it prior to picking it up, other than the fact that the main character was an anti-hero. Having read the book, I now feel that much of this book’s success can be attributed to it being one of the few Fantasy novels of its time to push certain boundaries. Therefore I need to give it credit where credit is due and say that Thomas Covenant is a terrific anti-hero. By the end of the book I actually disliked him more than at the beginning. I do not want to spoil anything for would be readers but there is a particular event at the start of the book which really surprised me. And not in a good way. In a way that instantly made me want to read something else because I detested the character so much. What saddens me is that Donaldson is a great writer. At times I really loved his descriptions, names and characters. But as a whole I just found it tiresome to finish the story. I didn’t care whether Thomas Covenant achieved anything. The basic premise of the story reminded me heavily of the Lord of the Rings. Yet it was different enough not to feel like it was borrowing too heavily. What I particularly liked was the different cultures which Donaldson developed, such as his giants and the people of the plains. They were a unique take and I found that refreshing. Saltheart Foamfollower was a character I instantly liked and, to be honest, kept me reading when I considered giving up. After finishing the book I hopped online to see what others had thought. Normally I do not do this but as I really didn’t enjoy the book that much, I felt that perhaps I had missed something. Never have I come across such polarizing reviews. It seemed that people either loved it or hated it. One star or five. I found few reviews that sat in the middle. Many of the negative reviews centered on that certain event at the beginning, and I can understand how that could turn someone away from reading any more of the book quite quickly. However, I found that when I read why people loved the book I started to see their points. Lord Foul’s Bane is best looked at through a lens. It may not be the best story, but it set out to create a unique world, with an anti-hero main character whose actions and behaviour go against what we expect in a novel. I think you need to consider when it was written whilst judging it. Fantasy writing has changed significantly since then. Modern novels trend towards faster pacing, more dialogue and less exposition. Donaldson covers some great themes in his book and I think it is true to say that reading the Chronicles is hard work. You almost feel as though you are studying an ancient roman text. That being said it is an exceptionally well written story. So now I ask myself would I recommend this book to my friends. The short answer is no. I do not feel that I would be looked upon favourably in doing so. But credit must be given. I understand why some people would love this book. And Donaldson is a great writer. I have simply decided it is just not to my taste. 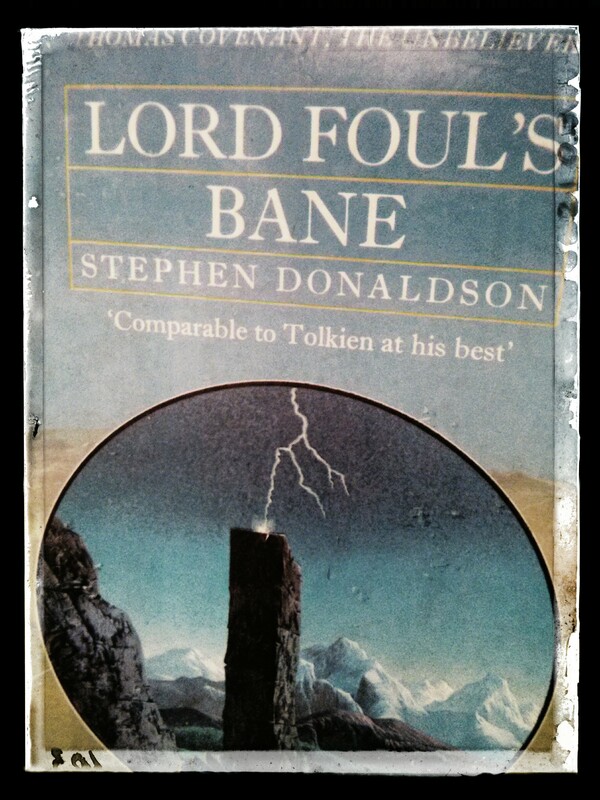 This entry was posted in Reviews and tagged Book reviews, Fantasy, Lord Foul's Bane, Reviews, Stephen Donaldson, Thomas Covenant by blottingaway. Bookmark the permalink. I saw this book on a friend’s read list, so I marked it down as one I wanted to read, but never got around to it. Character likability plays a big role in my enjoyment of a story, so I think I’d be in your boat. The unique world might be cool, but I don’t know if it’s enough for me to take time away from other books I have on my list. Yet. Great review, very helpful. Thanks! I think it is worth giving it a try. I would borrow it from a library first though. I still have friends who recommend I finish the trilogy and I think one day I will.